Every time I go home I go home I get so excited, not only because I get to see family and friends, eat great mexican food and enjoy beautiful weather, but also because I know, no matter what, I'll learn something new. It never fails, whether I'm out in the shop with my dad or in the kitchen with mom and grandmother. This last time I was home, we stayed in the house almost all weekend. The weather wasn't great, and the week before had been a busy week for me at a work thing, so I was exhausted and not really up for much. So, we laid in bed, watched netflix and cooked almost every meal at home. Naturally, I decided to grab my camera and share with you some of my grandmothers go to recipes for a simple and delicious dinner. This really is a simple and delicious way to cook tuna. 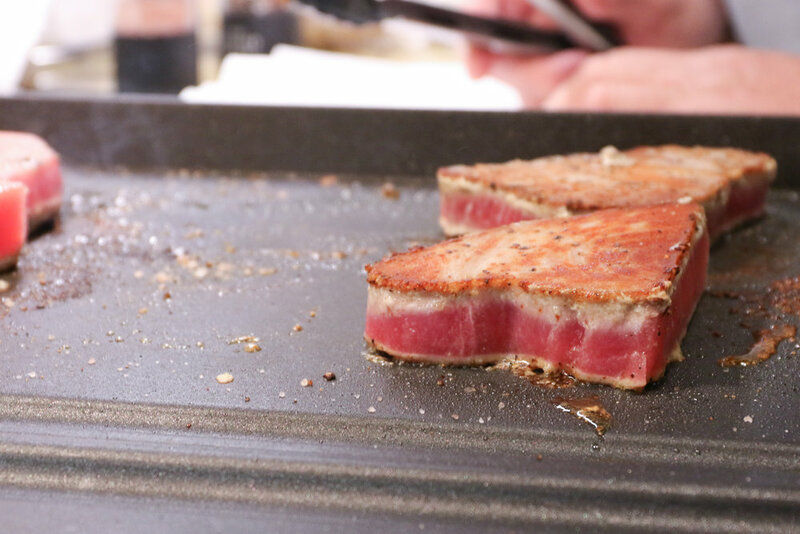 To start, cover the FROZEN tuna in olive oil and season your griddle with coarse black pepper and sea salt. 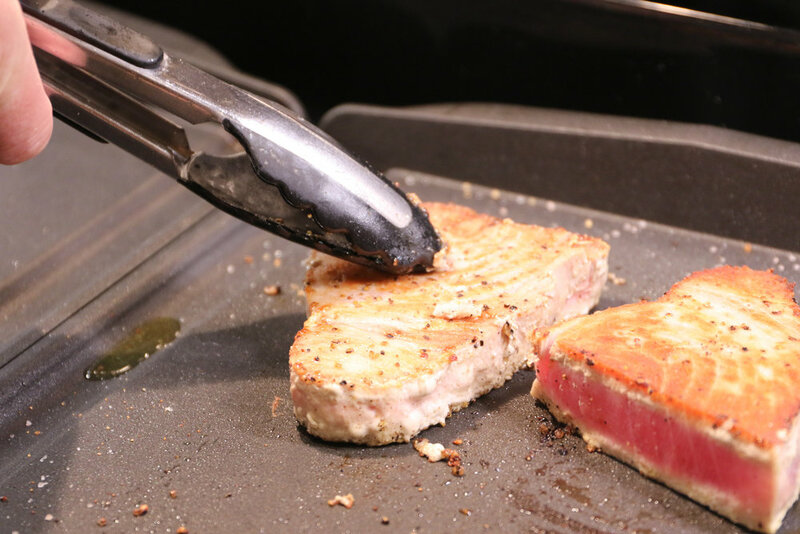 Let the griddle get nice and hot, and then place the oiled tuna, you should hear the sound of it sizzling and searing. Cover the top of the tun with finely ground spice mixture of Montreal seasoning, onion powder, and garlic powder. Let the tuna cook about a 1/4 of the way up then flip it. See that nice little even ring around the top and the golden crust that's formed on the outside? That's when you know you're in business. Let it cook just until the middle is heated all the way through. 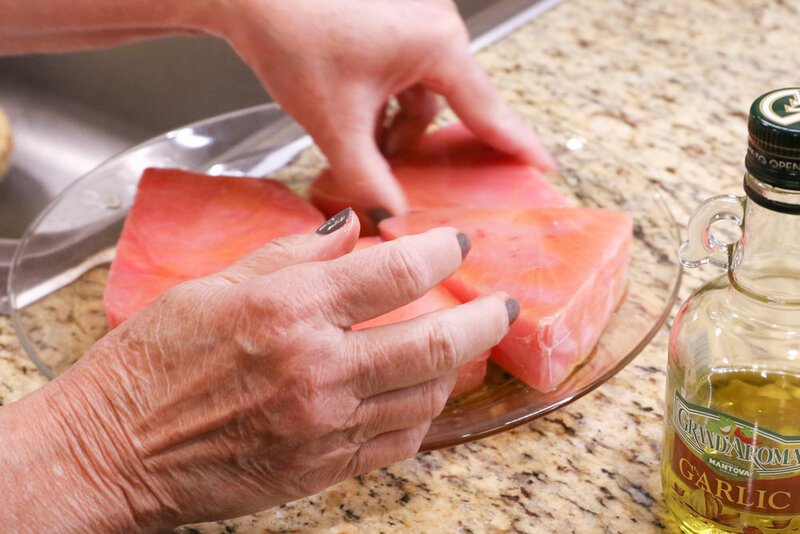 Since you're using a frozen fish, you'll know it's heated through when the center gives a little when you push on it with your tongs. Once it's finished slice it up, the inside should be a beautiful deep pinky red. Enjoy! Grandmother serves here with an asian salad mix that she buys at the store. To kick it up a bit she add Mandarin oranges and their juice, some water chestnuts, salt and pepper and sesame oil. The bag is a mixture of cabbage, carrots, cilantro, green onions, and a sesame ginger dressing. Mix all of it together and you've got an easy, delicious side for this fresh tuna. I know what I'm making for dinner this week. Do you?